G Suite is a comprehensive suite that combines GMail, Google Drive, and a number of other valuable tools created by Google to manage productivity. This article will walk you through what you need to get G Suite up and running. The instructions contained in this article are for adding the default G Suite plan with 30gb of storage. If you would like to setup up a G Suite account with unlimited storage and Vault, please contact our sales team directly at 310-841-5500. The first thing you'll probably want to do is add service for your domain to G Suite. Follow the instructions below to get started. From the Overview screen in your Account Center, scroll down to your G Suite service and click the Get Started button. You will be taken to the G Suite setup screen. Select either Yes if the associated domain is the one you wish to use or No if you wish to use a different domain. If you select No, you will be asked to input the domain you wish to use before being taken to the next step. You can input a new domain or select an existing active domain from your (mt) Media Temple account. 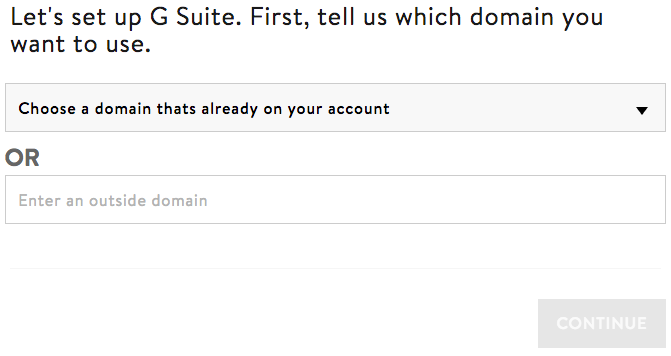 Once you have decided on which domain you want to use with G Suite, you will be asked to create your G Suite account. This is a separate set of credentials that you will use to log in to the G Suite Admin Panel (more on that later!) so don't forget them! Click on the Complete Setup button to continue. Your G Suite Super Admin user has been created! Now you can use this user to manage your G Suite settings through the G Suite Admin Panel. To do so, follow the instructions below. 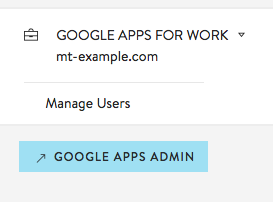 Now you can use the Admin Panel to manage your G Suite users, services, and settings. Now that you've set up your admin panel, the next thing you'll want to do is verify ownership of your domain with Google. There are a number of ways to verify your domain, but the recommended method is to add a TXT record or CNAME to your DNS zone file. For a comprehensive guide on how to verify your domain, please see the following article. Add an Email User + Additional User "Seats"
You can add a new email user to your G Suite account through the G Suite Admin panel or through your Account Center. However, if you have not purchased enough user licenses (referred to as "Seats" in Google terminology), you may see an error in either panel indicating that you have reached capacity. You can modify the number of Seats you've purchased from the Account Center by following the instructions below. From the G Suite Control Panel in the Account Center, select Add More Seats from the Manage Users area. Specify the total number of seats (i.e., G Suite users) you will need by changing the number in the popup box. You will be taken to a confirmation screen to verify charges for your new users. 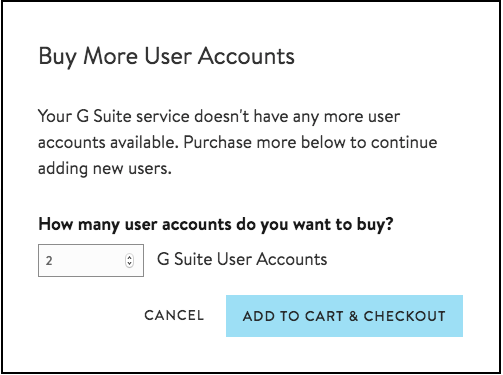 Confirm the additional charges to modify the number of G Suite users in your account. Once you've created your email users, you will want to migrate email from your old host to G Suite. Google has a mail migration tool that is quite popular and effective. For more information, please see the following article. The Migration Tool will not work until you have verified your domain with Google. To ensure a seamless transition in email service, we strongly recommend lowering the Time-to-Live (TTL) on your domain approximately 12 hours prior to making any DNS changes. Once you are ready to begin using G Suite, you'll want to point your domain's email services to Google's servers by modifying the MX Record for your domain. If you are using (mt) Media Temple's nameservers, you can also use our automated Point Mail to Google tool in the Account Center.